A view of Rafa Esparza’s “Staring at the Sun” at Mass MoCA. NORTH ADAMS — On a recent snowy evening, the artist Rafa Esparza was holding court with a small clutch of admirers at the Massachusetts Museum of Contemporary Art. Everything about the scene seemed a contradiction for the massive museum: In an institution where size matters — it boasts the largest square footage of any in the country — Esparza’s freshly opened show was small and intimate. Where exhibitions here typically last a year and often much longer — the museum’s showcase of Sol Lewitt wall drawings crested the decade mark in the fall, and won’t close until 2043 — Esparza’s installation, with its handmade soil bricks paving the gallery floor and crumbling slightly with every step, seemed unlikely to last out the week (this is part of the point, and we’ll get to that). And then there’s that other thing that sets him apart, if not here, perhaps, then in the museum world more broadly. “I like to use these materials to invite under-represented people into places like these,” said Esparza, who is imposingly tall with jet-black hair shorn close on the sides to reveal scalp tattoos. Around the room were large earthen panels, some of them dangling fine roots, as though cut abruptly from the ground and pinned directly to the wall. On them, Esparaza had painted family members, or members of his mostly Hispanic community in Los Angeles: twin boys with broad eyes and full lips; a woman in a radiant crimson dress. In the largest piece here, a woman in an emerald-colored sweater clawed at a section of chain-link fence, her eyes narrowed, peering out from behind her shoulder. Esparza’s careful not to give too much away, but her hunted look, fingers hooked sharply in the steel mesh, to me had a clear, disquieting currency. No one could have planned it, but the timing for the show could hardly be better — or worse, depending on your point of view. In this extraordinarily divisive moment — when we spoke, the federal government shutdown over a multi-billion-dollar wall on the Mexican border was entering its fourth week — the mood here felt undeniably fraught. Rafa Esparza preparing his exhibition. Indeed, as anti-immigrant and outright racist rhetoric has boiled over into violence and incendiary political stalemate in recent years, “these bodies” — black and Hispanic, the artist’s community — have suffered the worst of it. A two-hour drive south of Esparza’s home in Southern California lies its most emblematic flashpoint: The border with Mexico, on which President Donald Trump has staked his political legacy. 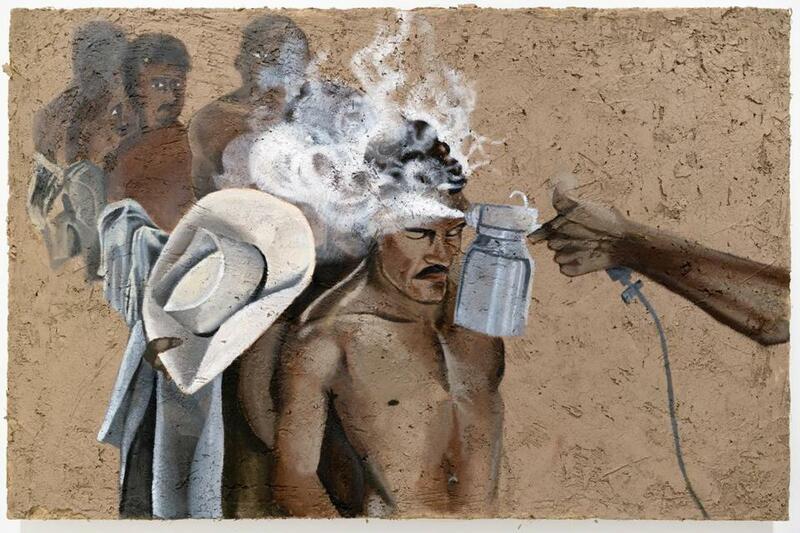 His artwork has always been aimed at a longstanding disparity: In the halls of the nation’s very official culture, artists like Esparza, whose parents emigrated from Mexico in the 1970s before he was born, are a very recent invitee. 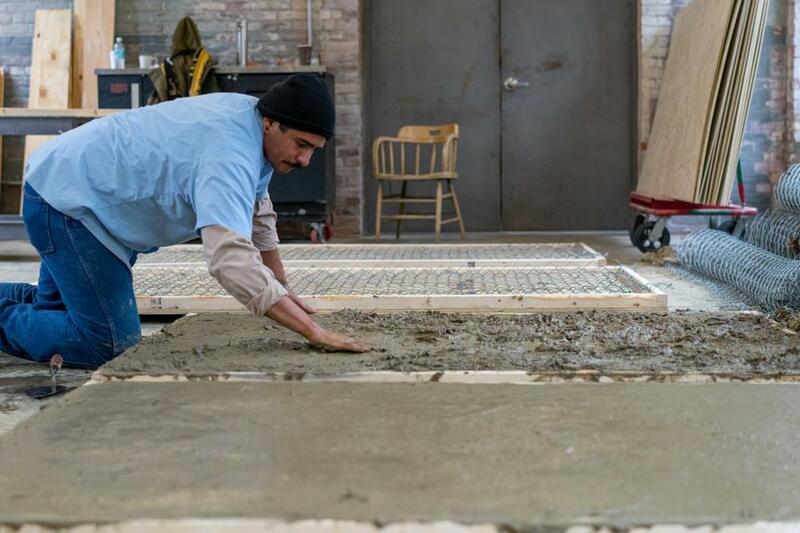 As institutions have scrambled in recent years to include communities and cultures historically left out of their programs, Esparza has been increasingly in demand. In 2017 he brought his bricks — adobe, fashioned from soil, horse dung, and the water of the Los Angeles river — to the Whitney Biennial. With them, he built an entire structure complete with walls — a sheltering space of communion into which he invited an array of artists whose work would likely never have been seen at so hallowed an event. A year and a half later, of course, walls have taken on an entirely new meaning. Given both his background and the long-dragged-on shutdown, Esparza’s gesture of inclusion might be read as bristling with political intent. He’s wary of saying too much, not wanting to limit his work or deaden its generous intentions with the flashpoint of the moment. There are no walls here — they’re conspicuous, perhaps, by their absence. Nonetheless, there’s an undeniable, disquieting resonance. Though he elides the hard rhetoric of the moment, it’s hard to look at Esparza’s work unbound from the politically divisive world in which we now live. How many parents just like his now linger at the southern border in an intractable limbo, or worse, had their children taken from them as they tried to cross it? The fence on which the emerald-clad woman — determined, terrorized, grim-looking – has hooked her fingers too hardly seems ambiguous, loaded with the intensity of this very moment. At Mass MoCA, Esparza had planned one of his performances, which in the past have invoked his family history in Mexico as he contemplated what was left behind. In “Tezcatlipoca Memoirs,” Esparza wandered the streets of his parents’ old hometown in Mexico using Google Streetview. It was an up-close view, but so far away, mirroring the split that the artist often feels as the product of two worlds on opposite sides of a border flashpoint, now powerfully at odds. The work defines the disconnect: Tezcatlipoca is the Nahuatl god of ancestral memory, with its warm associations of familial connection and deep roots; Google is the god of multi-terabyte memory, cold and disembodied, so you may draw the conclusions you wish. But the Mass MoCA performance was undone by a family emergency, leaving the work to stand on its own. And your reading will be your own, but here’s mine: As I walked into the space, the scent of it — musty, humid, the faint, pleasant odor of rotting earth — hit my nose before my eyes could take it in. 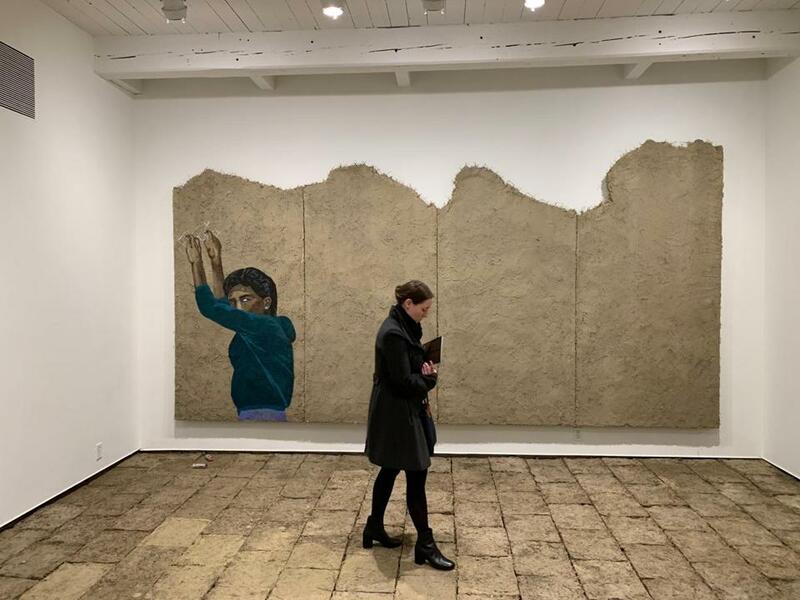 Blank panels of dried soil hung between the figures he had painted — spaces, perhaps, waiting to be filled, for the faceless, the nameless, the underrepresented are too many to count. Some of the bricks that make up the floor of the exhibition. Underfoot, Esparza’s bricks were crumbling, their sharp corners ground bit by bit into dusty fill, slowly erasing the gaps in between. Impermanence reigned. Esparza’s environments — hand-hewn, their labor explicit — were made to return to the earth, as all things do. Their soft construction made me think about the building I was standing in, built of brick forged from clay, standing for a century or more, but in the span of even human endeavor, a blip. Esparza called his environment “a vehicle to think about time,” and I think that’s where its power lies. 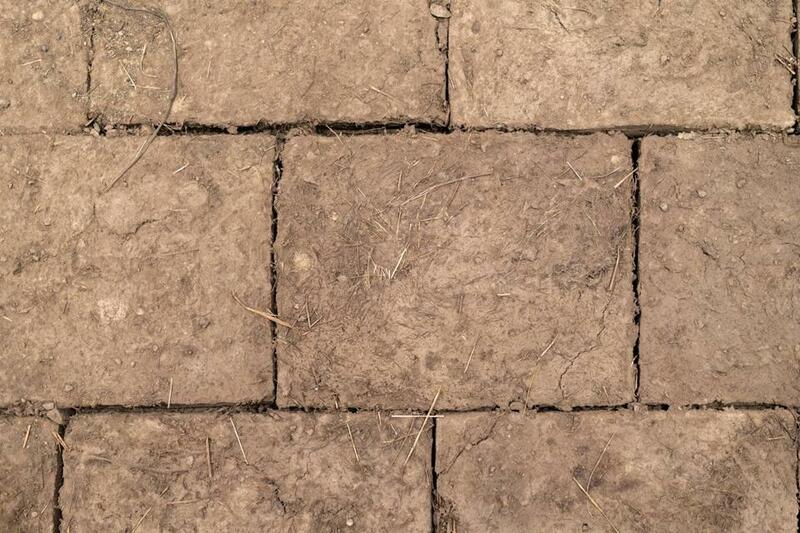 All is constructed, whether a building, artwork, or border; nothing is forever but the ground beneath our feet. We dwell in a moment. This one, however fraught, is no exception in one important way: That this, too, shall pass.